In 1959 the design teams of the German companies Bolkow, Heinkel and Messerschmitt were formed into a consortium named Entwicklungsring Sud to develop a Mach 2 VTOL interceptor for the Federal German defence ministry. Heinkel left the consortium in 1964 and in the following year it was re-formed as a company with the title Entwicklungsring Sud GmbH, known more usually as EWR. Two prototypes of the EWR VJ 101C single-seat experimental VTOL aircraft were built. Generally similar, they were both of high-wing monoplane configuration, primarily of light alloy construction, had retractable tricycle landing gear and accommodated the pilot in a pressurised cockpit, seated on a Martin-Baker ejection seat. Powerplant comprised six RB.145 turbojets, developed jointly by Rolls-Royce and MAN-Turbomotoren, with two mounted vertically in the fuselage, immediately aft of the cockpit, and two in a swivelling pod at each wingtip. Those in the fuselage were used only for VTOL and low-speed flight, those in the wingtip pods for VTOL, low speed, transition from vertical to horizontal flight, and high-speed flight. Control of the aircraft in flight had been explored by a hovering rig powered by three Rolls-Royce RB.108 lift-jets, and by May 1963 this had made a total of 70 flights. The VJ 101C X-1 prototype was flown for the first time in free hovering flight on 10 April 1963. It had exceeded a speed of Mach 1 several times before it crashed, following a vertical take-off, on 14 September 1964. The VJ 101C X-2 differed by having afterburning engines in the wingtip pods, providing greater power for take-off and landing, and this made its first hovering flight on 12 June 1965. 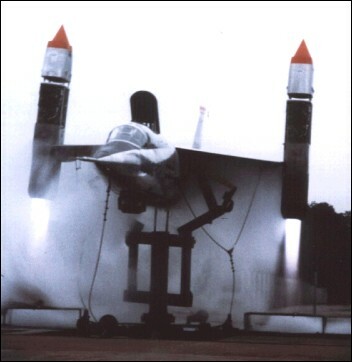 Four months later, on 22 October, the X-2 achieved the first full transitions from vertical to horizontal flight and vice versa, but development was discontinued soon after. Production of a single-seat interceptor was planned, under the designation EWR VJ 101D, but this would have differed considerably from the research prototypes. VTOL lift would have been retained by a battery of Rolls-Royce/ MAN RB.162 lift-jets in the fuselage, but primary propulsion would have come from two Rolls-Royce/MAN RB.153 turbofans mounted in the rear fuselage, these relying upon thrust deflection for control purposes. However, none of these aircraft was built. in wich the Luftwaffe cannot fully operate not only by lack of fuel, but also by marauding Allied fighters waiting for German aircrafts attempting to land or take-off from airstrips. I remember EWR well � I arrived in M�nchen July, 1966, (wife there on Fulbright) expecting to find a teaching job with Armed Forces Dependent Schools, who always needed math teachers. Meantime, DeGaulle pulled the French out of NATO, making AFDS relocate all the teachers from schools in France. Only year in history they had surpluses, even in math. I got the want ads, boarded Strassenbahn and began reciting "Ich bin ein Mathematiker", and landed a position as Diplom Mathematiker, Forschung with EWR on my first interview. It was an interesting year, two months reading German translations of Russian work in function approximation � needed for simulation, still in its infancy. Given the success of the flying trials, this may have been follow by firm purchase of the VTOL fighter by NATO countries instead of the accident-prone F-104 Starfighter. VTOL capabilies were essential in a country supposed at front line in an incoming world conflict, in wich all his airstrips for conventional aviation may be destroyed by first Soviet attacks. Also, in the mentality of German planners, may weight the experiences of 1944-45, in wich the Luftwaffe cannot fully operate not only by lack of fuel, but also by marauding Allied fighters waiting for German aircrafts attempting to land or take-off from airstrips. seems to be based on the F-104 starfighter frame with crude vtol add on, probably the earliest version of the vtol that has has been credited with the princepal.